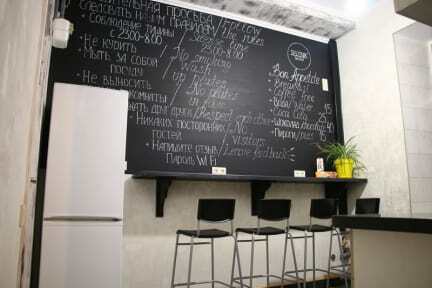 Sputnik Hostel Kharkiv is a small hostel in Kharkiv, Ukraine. The hostel opened in April, 2017 and offers a high quality for a good price. It's comfortable, quiet and modern hostel, designed to change the attitude of our guests to this type of accommodation. Sputnik is a small hostel - there are only four dorm rooms and no private rooms. Rooms are spacious and bright. Each of them have of course been completely renovated and equipped with two nice bathrooms. There is a common kitchen with all necessary appliances and accessories. Сomfortable common area for work and leisure with a multitude of outlets. Sputnik is located in the historical heart of the city, near Lopan river. The hostel’s entrance is not marked, so it is important to contact us in advance. Or, if you pal up with local geography and manage to find us, you must call number three on the building’s phone system when you reach the building. The hostel is located at the second floor. The hostel is basically a small corridor with three rooms on the right side, as seen from the entrance. At the entrance there is a reception and at the back there is a small common area. There is a couch, a flat-screen TV, and a small desk with stools and plugs. Here is also a bookshelf, there are books for every taste. We offer comfortable 4 and 8 person dorm rooms. Each bunk bed has a curtain for more privacy, an individual plug, and reading light. Underneath the beds there is a spacious locker where you can even fit your bag. Slippers and towels are also supplied. There are two nice bathrooms, which is normally enough to avoid morning queues. Bathrooms are nice and spacious. The shower has a good pressure and is connected to central heating instead of a boiler. Additionally, there is a well-equipped kitchen with stools and a small but room-wide desk where you can sit and eat. It should be noted that drinking alcohol and smoking in this hostel is strictly forbidden and that you will need to go out to a bar to have a beer. You can order a light breakfast for 30 uah. However, tea and coffee are free. 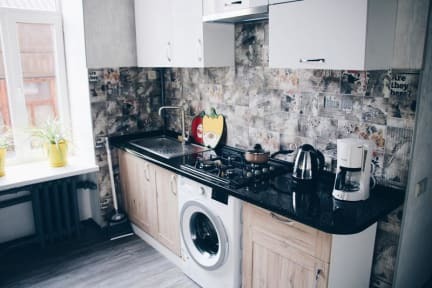 The hostel allows a laundry service and (30 uah); hair dryer, iron, ironing board and a stationary dryer for clothes are available on a free basis. Taxes not included - occupancy tax 1.00 % per person per night.